I’m a fan of doing some big cooking on the weekend and then using the leftovers in other meals during the week. My wife and I both work and by the time we get home and pick up the kids from their different after school activities it’s already pretty late and everyone is starving. Getting the cooking that takes a long time done on the weekend really helps with the weekday meals. For example, last weekend I made pulled pork in the crock pot and we had several meals with the leftovers during the week. 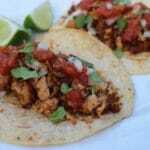 I’ll create some posts about the other recipes but I want to start with my Pulled Pork Taco Recipe. Making pulled pork in the crock pot is pretty easy. Just sear the pork loin on a hot skillet and then put it in the crock pot with a can of root beer for about 6 hours. Then shred it up with some forks. How easy is that? My parents showed me this recipe and I’ve been using it ever since. If you think adding root beer is crazy, don’t worry it doesn’t taste like soda, it just tastes great. In Mexico, when you braise or roast pork (usually in lard) and then shred it, its called carnitas. Pulled pork is very similar but not quite the same. 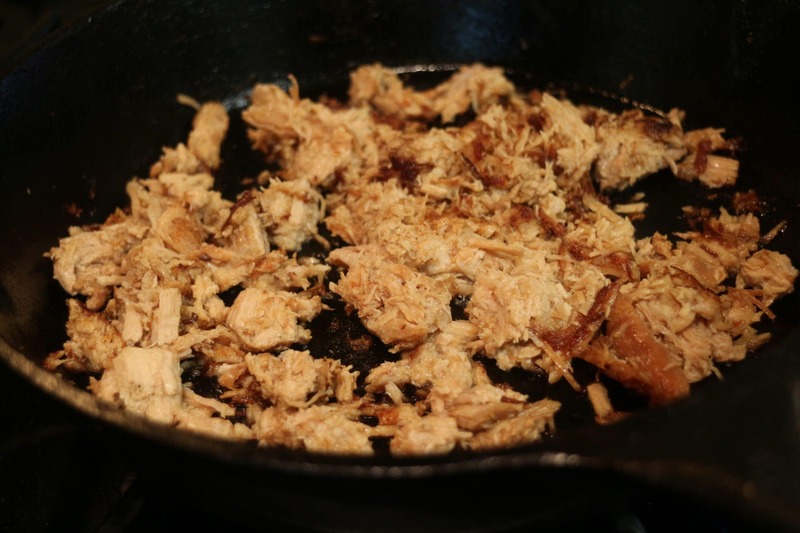 So when I reheat the leftover pulled pork for this taco recipe, I put it in a cast iron skillet with some butter. This way it gets heated up and takes on more of a roasted flavor. Don’t stir it too much and let those delicious crunchy bits start to form. 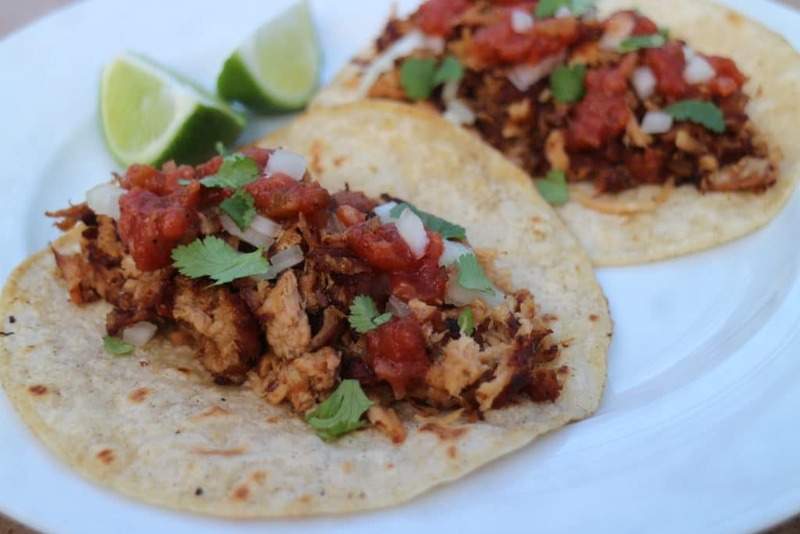 While you are heating up the pork, you definitely must heat up the corn tortillas. Don’t use the microwave for this step because that would be a mistake. 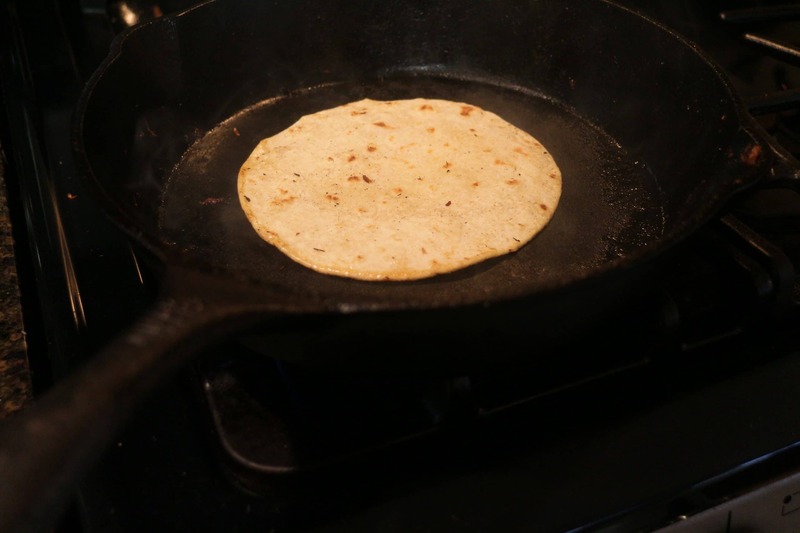 A warm and slightly charred tortilla is the goal so use a frying pan or spread them out on a cookie sheet and place in the broiler. Pick your favorite salsa or make your own. A fresh salsa will really make this recipe pop. I make a decent salsa with vegetables from my garden every summer and it doesn’t get fresher than that. You can’t beat garden tomatoes. But hey if it’s the middle of winter, it’ll still taste great with jar salsa. Chop some onions and cilantro and then quarter some limes and you have everything you need to make these pulled pork tacos. I told my family they were carnitas tacos just to sound more exotic. When I have leftover pulled pork, my go to meal is pulled pork tacos.